What is the connection between Alexander, the Persian Mastiff (Sarabi dog), and the Turkish Kangal? Where did the dog come from? Which breed was Alexander’s dog? This article explores this mystery in depth. Peritas was a much-loved dog of Alexander the Great (356 BC-321 BC). Apparently there were two dogs of Alexander named Peritas. One he raised himself Plutarch writes, “he also, we are told, built another city, and called it after the name of a favorite dog, Peritas, which he had brought up himself.” This dog might have been a greyhound type. But another breed seems to have accompanied him on the journey eastward in the early years of Greece. We know this because the “Mastiff” breed was unknown to the West until the return of Alexander’s army after the death of Alexander. Pliny writes this of a dog given to Alexander in northern Greece. 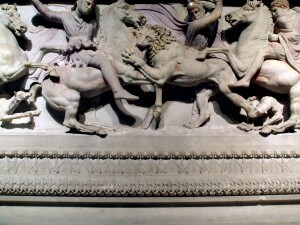 When Alexander the Great was on his Indian expedition, he was presented by the king of Albania with a dog of unusual size; being greatly delighted with its noble appearance, he ordered bears, and after them wild boars, and then deer, to be let loose before it; but the dog lay down, and regarded them with a kind of immoveable contempt. The noble spirit of the general became irritated by the sluggishness thus manifested by an animal of such vast bulk, and he ordered it to be killed. 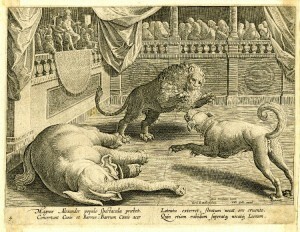 The report of this reached the king, who accordingly sent another dog, and at the same time sent word that its powers were to be tried, not upon small animals, but upon the lion or the elephant; adding, that he had had originally but two, and that if this one were put to death, the race would be extinct. 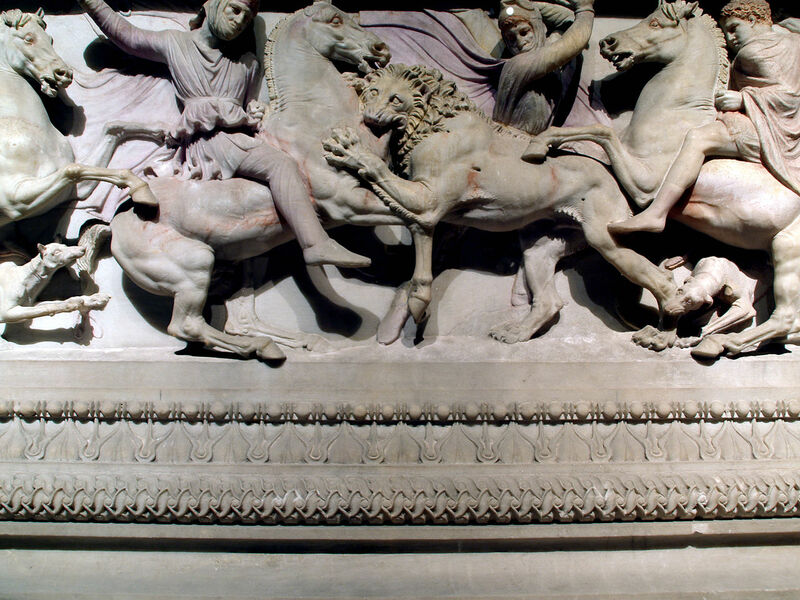 Alexander, without delay, procured a lion, which in his presence was instantly torn to pieces. He then ordered an elephant to be brought, and never was he more delighted with any spectacle; for the dog, bristling up its hair all over the body, began by thundering forth a loud barking, and then attacked the animal, leaping at it first on one side and then on the other, attacking it in the most skilful manner, and then again retreating at the opportune moment, until at last the elephant, being rendered quite giddy by turning round and round, fell to the earth, and made it quite reecho with his fall. Was Peritas THIS dog? It is not known. Was Peritas one of these 150 dogs? The Kangal dog is said to be related to Peritas and the Persian mastiff. 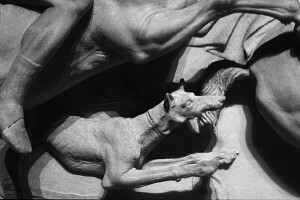 In Ninevah and Babylon they had a great dog in very ancient times. Lots of ancient artifacts remain showing the size and figure of this dog. Even from one of the oldest cities known to man–Catal Höyük. What we DO know of Peritas is that he existed, and was loved by Alexander. It is said that he saved Alexander’s life. He is listed on CNN’s “Ten Dogs that Saved the World”: “Without his dog, Peritas, Alexander the Great might have been Alexander the So-So.” According to the story, during the Battle of Guagamela against Darius III, an elephant charged at Alexander. 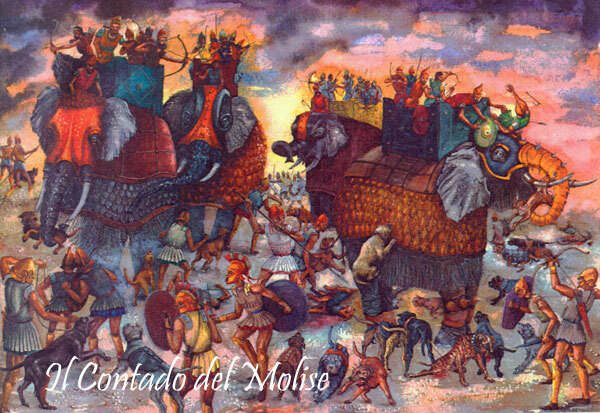 Peritas howled and ran toward his master, grabbing the elephant by the lip and stopping its charge. This act saved Alexander but resulted in the death of Peritas, for you can imagine how the elephant felt about a dog on its lip, and what it would do to get it off. It is a great story, worthy of the breed, worthy of our belief about the faithfulness of dogs. However, search as I might, I could find no primary source to document this legend/tale. It is a story passed on, but not documented. If you do find a source, let me know! Is the Kangal of today the same as the Sarabi dog of Iran? We raise Kangals. Our boy is reported to be the biggest in Turkey, until his son who is threatening to be taller than him. Those who know Kangals rave about our beauties. A dear Iranian friend from the town of Sarabi in Iran visited us and was thrilled to see our dogs. “These are OUR dogs,” he said. “These are Sarabi dogs!” This evidence is anecdotal, for sure, but as far as common understanding of the two breeds go, it works as documentation. So we suspect that Kangal and Sarabi are identical. 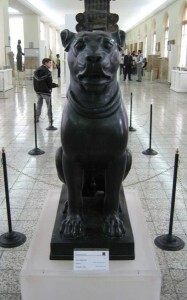 But is the Sarabi dog of Iran related to Alexander’s great lion-killer? Xerxes brought back to the area a Tibetan Mastiff, known to be a lion-killer. 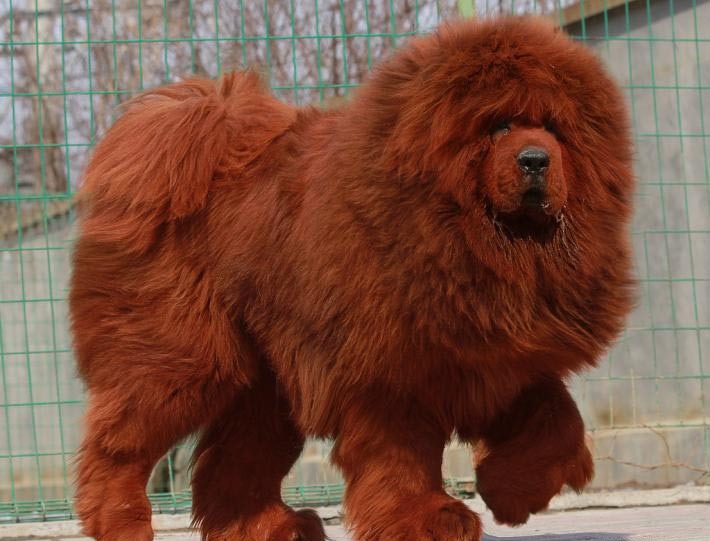 Some think this began the breed of the Iranian Mastiff/Sarabi dog. 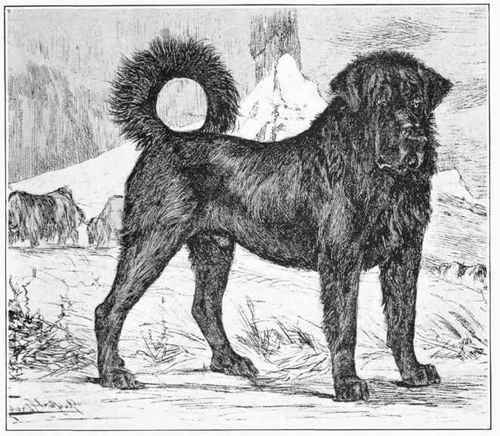 However today’s long-haired TIbetan Mastiff more resembles a Newfoundland than a Kangal. 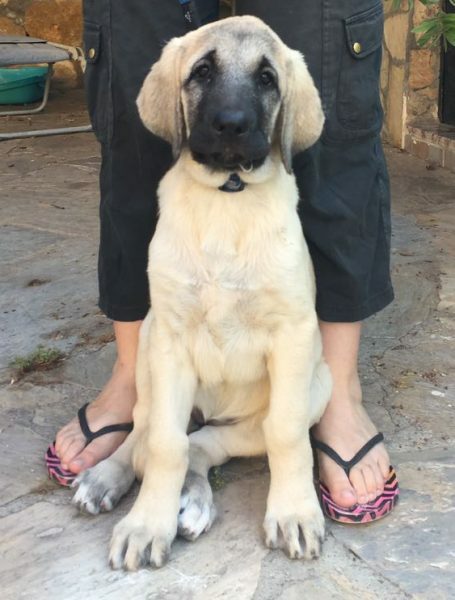 Though it has a Mastiff shape, under all that fur, it bears only a hint of the Kangal. The colors are wrong–it lacks the unique white coloring and black muzzle–but it does sport the curly tail. This statue, the Mesopotamian Terracotta Dog with Kassite Cross from Mesopotamia; 1800-1600 BC, has more of a Newfie look. We own a Newfie as well and they are bearlike with a chunky look, as this one. Click here for more pictures of this dog statue. This statue dates a thousand years before Xerxes, though being a warring people, certainly the Persians could have had access to the breed earlier. If you look at the Historical Records, you can also clearly see this connection as you read primary documents of what people thought of these dogs. Paul Strang, a cynologist and a noted authority on the Great Pyrenees, observes in his book “The Complete Great Pyrenees”, that the existence of massive native breeds today in Turkey, Iran, and Southern Russia could support the theory that the ancestors of today’s mastiff breeds came from the Middle East. Other serious cynologists, such as David and Judy Nelson, agree with that possibility. Remains of domestic dogs from 5500 years ago have discovered in many parts of Iran of today. But the territory of Iran of today is not the same lands of old Persia which was much bigger and included the lands from India in east to Greece in west. Even the areas of southern Russia and the central Asia of today (Caucas, Azerbaijan, Armenia, Georgia and…) or better to say the origin area of Mid. Asian and Caucasian shepherds were the Iranian territories and passed to Russia after peace between the two countries, just about 100 years ago. These areas were the “lands of mastiffs” for thousands of years. …One of the best known dogs at that times was the “Assyrian dog” which were used as hunting and guardian dogs. 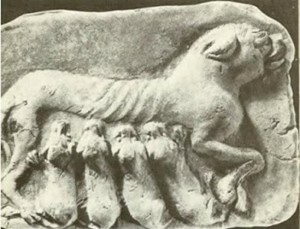 When the Assyrian empire crumbled the Medes and the Persians (the first rulers of ancient Iran) and all the hunts-men kings of the orient, paid enormous sums for these magnificent dogs whose role seems to have been as important as that of the greyhound in the history of the canine race. At “Shush Fortress” in south western of Iran there is a form of these dogs (with black color) that gallops for hunting with some riders. 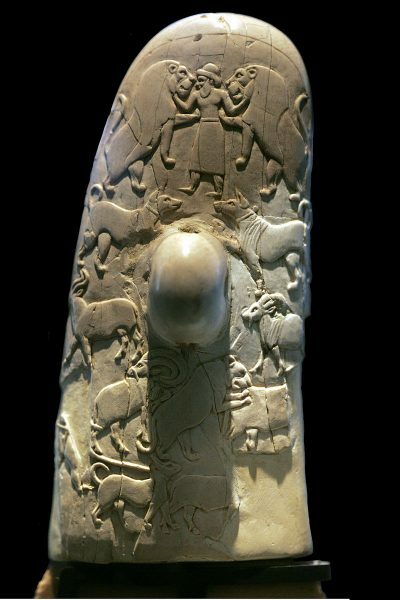 The oldest record of Babylonian/Egyptian relations is the Gebel el-Arak Knife, which shows Gilgamesh slaughtering beasts, and at his side are two broad-chested dogs that have the curly-tail of the Kangal/Sarabi dog. In army Persians used Indian dogs (mastiffs) but just for guarding and not suicide jobs. Herodotus (7.187) says in his book that heavy powerful dogs “Indian mastiffs” were introduced in to Greece by Xerxes 1 when he marched toward this country (486-465 BC). (Alexander the great on his return from India, brought back a very similar type of dog). Grattius called these Indian dogs as “Tibet dogs”. Even in this time one of the biggest “Satraps” of Persia in Babylon paid all of its taxes for the expences of breeding and to take care of these dogs (Herodotus, 1.192) that guarded the soldiers camps and captured enemies prisoners. 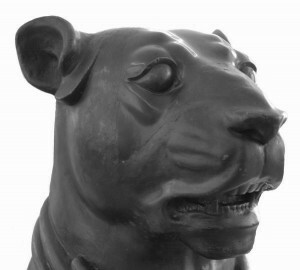 In “Iran bastan Museum” in Iran there is a statue of a great mastiff dog of black marble stone … from 2500 years ago in Persia. Trackback and Trackback2. What this means is a big mystery, since Aelian (Claudius Aelianus) had access to records that are no longer in existence. His comment is in a book on animals, and where he found this out is unknown. But the fact remains that right here we have (from other sources) Alexander coming upon the dead man and regretting that he was dead. But Alexander and an Iranian Dog come head to head in this little mysterious anecdote that occurred in July 330 BC. Did he take the dog with him? 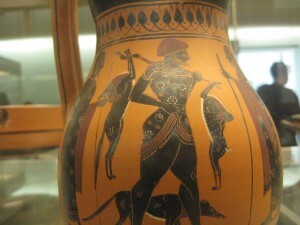 Did a soldier of Alexander’s take on the dog? What would someone do but try to comfort the grieving pet. Perhaps he adopted the dog??? 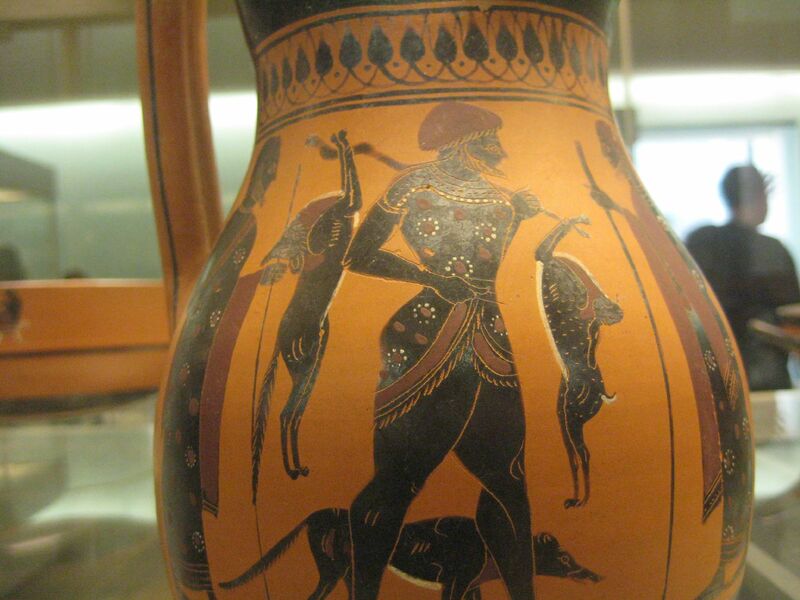 See Dogs in Rome and Greece for a detailed explanation of the kinds of dog artifacts found. Also, the most amazing site on identifying the history of the Persian Mastiff/Sarabi/Alexander’s dog is this one: David Hancock on Dogs. Related to this is an interesting slideshow of other historical leaders who loved their dogs. In Trunk of Scrolls, the dog that the Merchant leaves behind is one of these Sarabi dogs. Proverbs 12:10 says “The righteous care for the needs of their animals, but the kindest acts of the wicked are cruel.” We see the care and relationship that our main characters show toward their animals, as opposed to the abuse of Merchant upon his own. We have some huge and beautiful Kangal dogs, which are related to the Sarabi dog. These were the inspiration for the role the great breed played in Trunk of Scrolls. Our lady is incredibly gentle with children and our other dogs. She proves her strength quickly to new dogs we get, and immediately reminds them she is the QUEEN and KING of our property, which is really no problem to her laid-back mate. At night they do not let a leaf into the property without letting it know it’s not welcome. Their deep alerts echo along the road, an audible “Do Not Enter” to anyone passing by our farm.